Sometimes all you need is luck, a jar of chutney, a pack of frozen chicken and handful of cashews to create a finger lickin’ dish. No kidding. After Ramadaan and Eid I am being lazy and don’t feel like spending much time in the kitchen plus it is hot and humid these days. 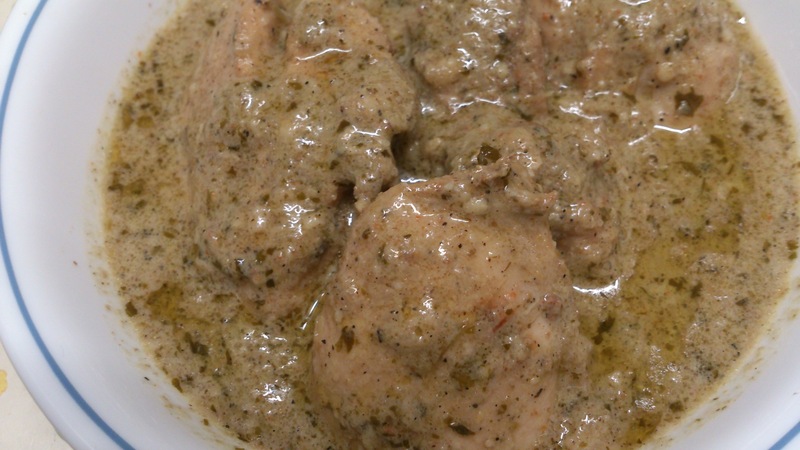 Green chutney that I used for this chicken is very simple and very commonly served with our traditional and not-so traditional snacks like kebabs, samosas, pakoras, sandwiches and wraps etc. Feel free to use green chilli paste instead. 1/4 – 1/3 cup distilled white vinegar. Put all ingredients in the blender and blend till smooth. Start with 1/4 cup vinegar and if you find chutney too thick and chunky add a little more. Adjust the spice level as you like. Store in an airtight glass jar and refrigerate for up to six weeks. Lets get to the real deal… Btw I used chicken pieces but I am pretty sure boneless chicken would be even better. Marinate chicken with all the listed ingredients for at least 1 hour. Heat cooking oil in a heavy wok or pan and add onion paste. Cook on medium flame for a bout 2-3 minutes, we do not need golden brown color here. Add marinated chicken to the wok/pan. Add nutmeg, coriander powder and black pepper powder and let it cook for 8-10 minutes, stirring at intervals. Add cashew paste and green chutney ( or green chilli paste); cover the pot and let it cook till its cooked through, about 5-7 minutes for boneless and up to 10 minutes for thighs, on low medium flame. Add cream, mix well, cover and simmer for 2 minutes. Switch the flame off and let it sit for a couple of minutes. Serve with naan or steamed/fried rice. My wife tried it and it turned out awesome. Thanks for the recipe.